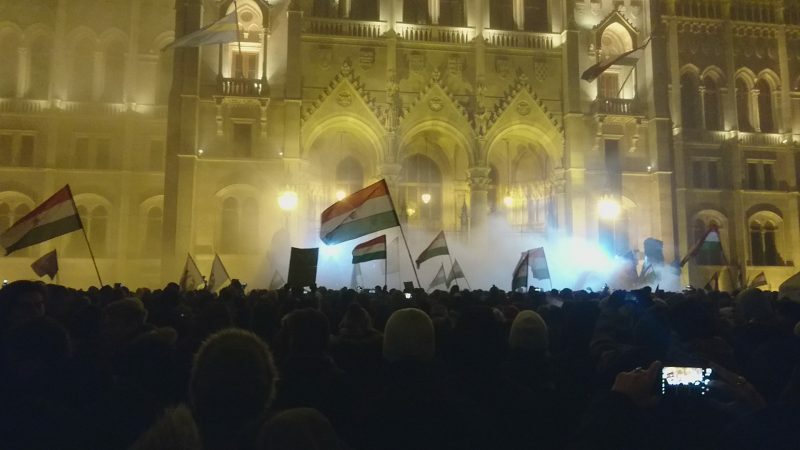 This article is based on the story “Hungarians protest against the government in front of Parliament every night” written by Anita Kőműves, with photos by Márk Tremmel and Áron Halász for Atlatszo.hu, Hungary’s first investigative journalism non-profit. It is republished here in edited form through a partnership with Global Voices. 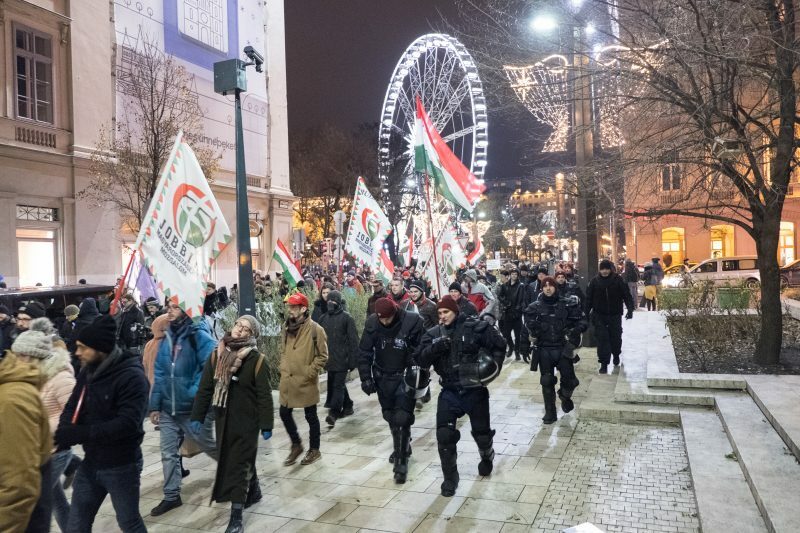 Hungarians have been protesting in front of the Parliament building and across Budapest since Viktor Orbán’s right-wing party passed a bill allowing employers to request 400 hours of overtime work from employees annually as well as a bill which would make it easier to fill the court with judges that are loyal to Orbán’s party. Despite the cold weather, protesters were out in the streets until after midnight every night — actions which were met with police tear gas. 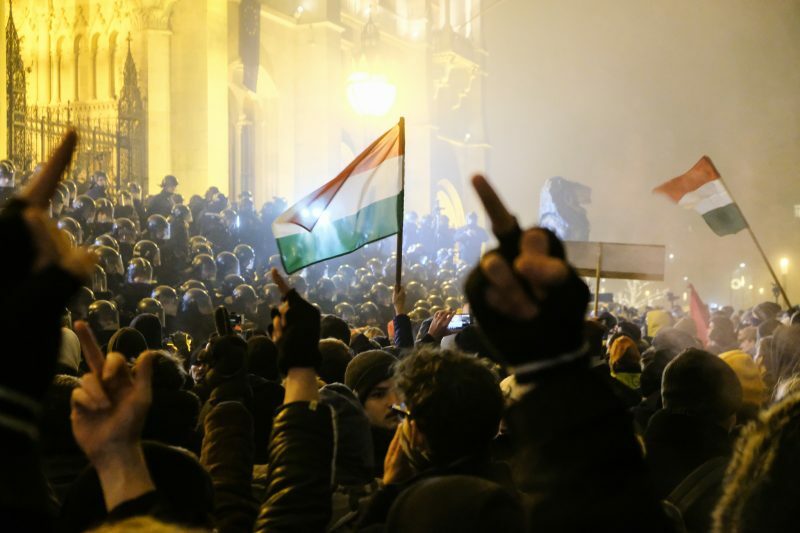 The Hungarian Parliament passed two important bills on Wednesday. 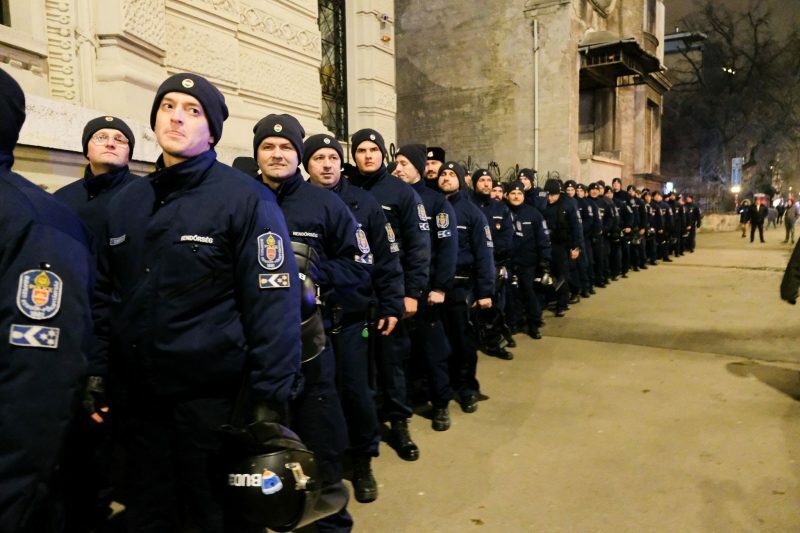 Even though opposition parties protested the two bills, the body dominated by the governing right-wing conservative party Fidesz (Hungarian Civic Alliance) was able to pass the so-called ’Slavery Law’ and a law creating a new court system. The newly created administrative courts will be entirely separate from the current court system. They will be overseen by the minister of justice and rules will make it easier to fill the new court with judges loyal to Fidesz. The administrative courts will be able to rule in politically sensitive cases such as corruption and electoral law and freedom of assembly. The so-called ’Slavery Law’ will raise the 250-hour annual cap on overtime work to 400 hours. Moreover, employers will be able to take up to three years to pay compensation for the overtime work. The Police used tear gas against protesters in front of the headquarters of the public broadcaster TV. Atlatszo.hu documented these developments by providing a live video feed from the scene on Facebook.